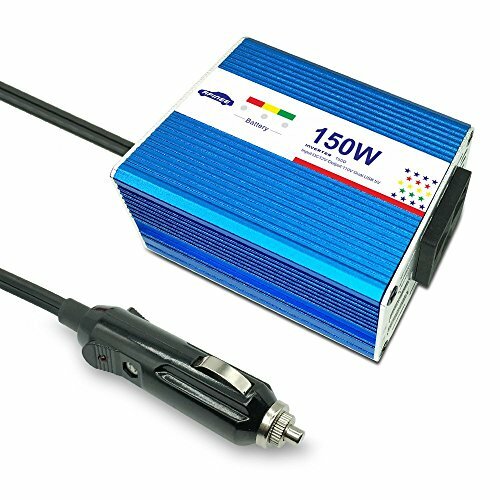 IF-150D solar power inverter DC 12v to AC 110v 150w car power inverter with battery display. This inverter is easy to use, it can convert DC power 12V to AC power 110V as output, you can enjoy the intelligent life and mobile business after connect inverter to car cigarette lighter or lead-acid battery.it can provide stable AC power for: lightings, electrical tools, laptop, digital photo printer, electric shavers, digital cameras, mobile phone charging, camcorders, portable audio, TV,fans and other electrical equipments. Support battery power detection and negative ion air purification, improve the quality of life. Any question during use, please kindly contact our store to get the best after-service. TWO PREMIUM and UNIQUE FEATURES from other similiar products. 1, LCD battery power display, it will prevent inverter from drying death your automobile battery amid outdoor activities; LCD will clearly show your battery power remaining. 2. built-in fuse to protect your device safely against overheating, under and over voltage charging, short circuiting, overloads, and overcharging, once the fuse damaged, it is VERY EASY to switch and replace with extra one, as images shown. EXTREMELY QUIET; high quality cooling fan, tranquil motor, running without noice. DOUBLE USB; dual USB output 2.1A and 1A enable charing phones and tablets simultaneously; while AC outlet charging laptop, breast pump, CPAP machine, nebulizer, game console, kindle, TV, DVD players, lights, iPad, and other electronic devices. ALUMINUM SHELL, portable and lightweight 8 oz+ . Solid shell. If you have any questions about this product by APINEE, contact us by completing and submitting the form below. If you are looking for a specif part number, please include it with your message.